Zumtela Bay Conservancy was established as part of government’s land use decision for the North Coast planning area. The conservancy contains a registered boat haven and anchorage and provides sport fishing and diving opportunities. Zumtela Bay Conservancy covers 18 hectares of upland adjacent to the bay and 31 hectares of foreshore, and includes the marine waters within Zumtela Bay and the island at the mouth of the bay. There are no facilities in the conservancy. The conservancy protects cultural values, such as important harvesting and gathering areas. 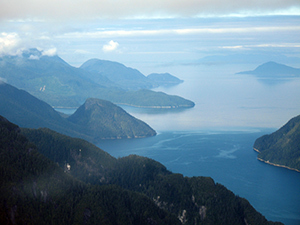 The conservancy is located approximately 25 kilometres north of Prince Rupert. History: Zumtela Bay was identified as a potential protected area as part of the Protected Areas Strategy in the 1990s. The North Coast Land and Resource Management Plan (2003) also recommended designation of Zumtela Bay as a protected area. The Zumtela Bay Conservancy was established by the Province on June 27, 2008. Cultural Heritage: Zumtela Bay Conservancy encompasses a bay and surrounding upland and intertidal area where the Coast Tsimshian have strong cultural interests. These interests include the desire to pursue their traditional activities as they have done since time immemorial, in a manner that sustains the biological diversity and natural values of the bay. Zumtela Bay is in an area known to the Coast Tsimshian as K’ala Kwtuun. It is an intensive traditional use area that is considered part of the Coast Tsimshian “breadbasket”. For millennia the area has been, and continues to be, an important source of natural resources for food, medicines, cultural materials, and economic goods. The Coast Tsimshian have numerous harvesting and gathering sites in the area, and in the adjacent and nearby foreshores and waterways. There are eighteen Indian Reserves located in Work Channel. Conservation: Knowledge of the conservancy’s flora and fauna, especially ecosystems, ecological communities and species of conservation concern, is incomplete. Wildlife: Marine wildlife species that have been recorded in or near the conservancy are; canopy kelp beds, harbour porpoises, herring, herring spawn, humpback whales, and killer whales.